An Email Marketing Specialist takes charge of running the email marketing campaigns, creating newsletters, managing email databases, optimizing email campaigns for better deliverability and higher open rates. 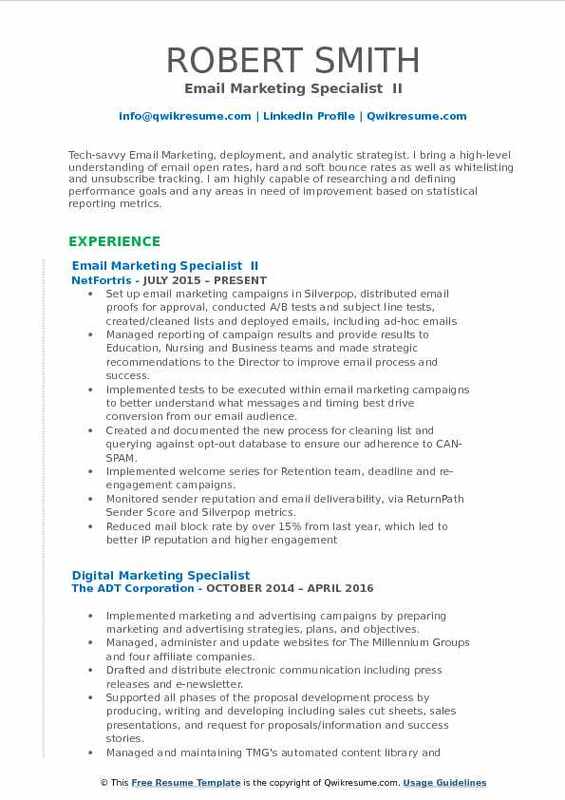 The various other job tasks that are discharged by an Email Marketing Specialist include identifying the target audience, designing and implementing direct email campaigns, proofreading emails, writing newsletters, upgrading present templates to a personalized one with advanced features, ensuring prompt and accurate communication to the clients, analyzing campaign performances and delivering sales revenue reports. 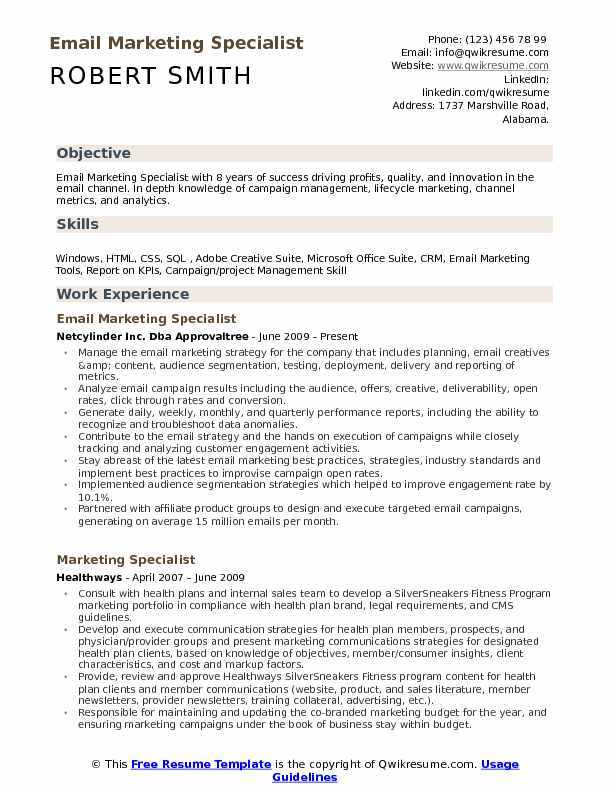 A well-crafted Email Marketing Specialist Resume sample depicts some core skills such as Digital marketing experience, Knowledge of SEO/SEM, proficiency in marketing automation technology and proficiency in various marketing automation tools. To make a career as an Email Marketing Specialist, a person must hold a Graduation in marketing, business, finance or its related field. 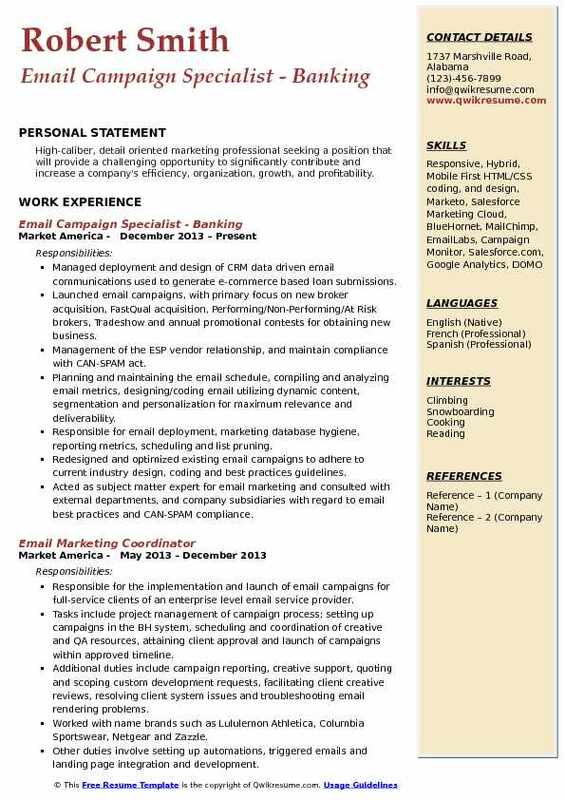 Summary : Email Marketing Specialist with 8 years of success driving profits, quality, and innovation in the email channel. In depth knowledge of campaign management, lifecycle marketing, channel metrics, and analytics. Manage the email marketing strategy for the company that includes planning, email creatives & content, audience segmentation, testing, deployment, delivery and reporting of metrics. Analyze email campaign results including the audience, offers, creative, deliverability, open rates, click through rates and conversion. Generate daily, weekly, monthly, and quarterly performance reports, including the ability to recognize and troubleshoot data anomalies. Contribute to the email strategy and the hands on execution of campaigns while closely tracking and analyzing customer engagement activities. Stay abreast of the latest email marketing best practices, strategies, industry standards and implement best practices to improvise campaign open rates. Implemented audience segmentation strategies which helped to improve engagement rate by 10.1%. Partnered with affiliate product groups to design and execute targeted email campaigns, generating on average 15 million emails per month. 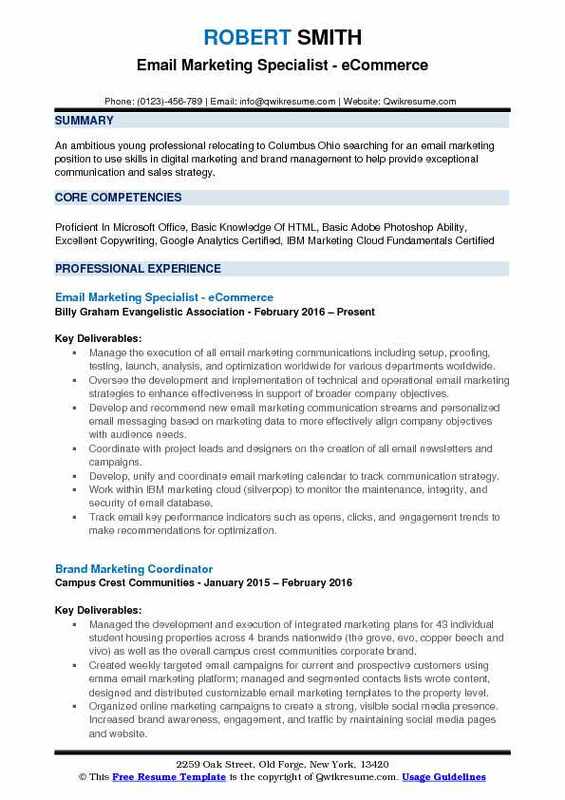 Objective : An ambitious young professional relocating to Columbus Ohio searching for an email marketing position to use skills in digital marketing and brand management to help provide exceptional communication and sales strategy. Manage the execution of all email marketing communications including setup, proofing, testing, launch, analysis, and optimization worldwide for various departments worldwide. Oversee the development and implementation of technical and operational email marketing strategies to enhance effectiveness in support of broader company objectives. Develop and recommend new email marketing communication streams and personalized email messaging based on marketing data to more effectively align company objectives with audience needs. Coordinate with project leads and designers on the creation of all email newsletters and campaigns. Develop, unify and coordinate email marketing calendar to track communication strategy. Work within IBM marketing cloud (silverpop) to monitor the maintenance, integrity, and security of email database. Track email key performance indicators such as opens, clicks, and engagement trends to make recommendations for optimization. 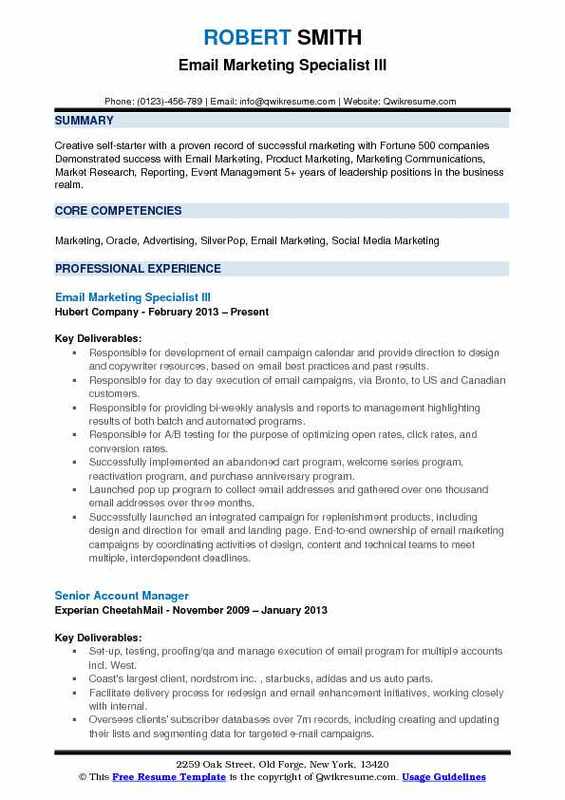 Objective : I am a tech-savvy professional seeking a rewarding digital marketing and marketing automation role. My strengths include exceptional time management, ability to multitask, and willingness to assist my team at all times. Responsible for managing marketing automation efforts and manage all components of email scheduling, management, and deployment, ensuring an engaging client experience. Create, deploy and manage day-to-day email campaigns of varying complexity using marketing automation plat- form (Marketo), including simple one-off emails, blog post emails, drip and nurture campaigns. Deploy and Manage Automation tools (Marketo), CRM data (SalesForce), data reporting tools (excel), and making simple updates to the website. Partner with sales, marketing, and channels to help develop & implement email campaign plans, copy/content, and execution, including setup and manage email distribution lists, develop and manage the marketo-based leads. Design and development of Forms, Campaign Landing pages, Tag/UTM assignments to ensure accurate tracking. Code and deploy all email communications to clients and prospects, including marketing emails, client communications, pre- and post-event communications, product communications, etc. Develop email marketing best practices and ensure we are delivering consistent communications, creating a positive experience while staying in line to brand guidelines. Objective : Results- and analytics- driven professional who has grown revenues in good and bad economic climates. Also offered an unswerving focus on email marketing ROI and budget efficiency. Combines broad-based traditional graphic design background with specialist expertise in email marketing, and optimize email campaigns. Create Email Marketing strategy for the organization and drive entire email marketing campaigns that include Copywriting, design, coding, and deployment through ExactTarget program. Implemented testing and segmentation strategies into email marketing campaigns to drive optimized open rates and increased leads. Tracked weekly large-volume (1 million+) email blasts, triggered sends and email alerts within ExactTarget email platform. Strategized and implemented efforts to increase email deliverability performance utilizing returnpath. Optimized segment space automation growth by leading email marketing strategy, including message, segmentation analysis and content creation. Strengthened branding initiatives by working with CRM, creative and sales teams to improve customer experience through email campaigns, monitoring and analyzing performance data, and identifying needed changes and improvements that maximize outreach. Sustained an optimal IP sender score , enhancing inbox delivery and corresponding metrics while improving delivery metrics. 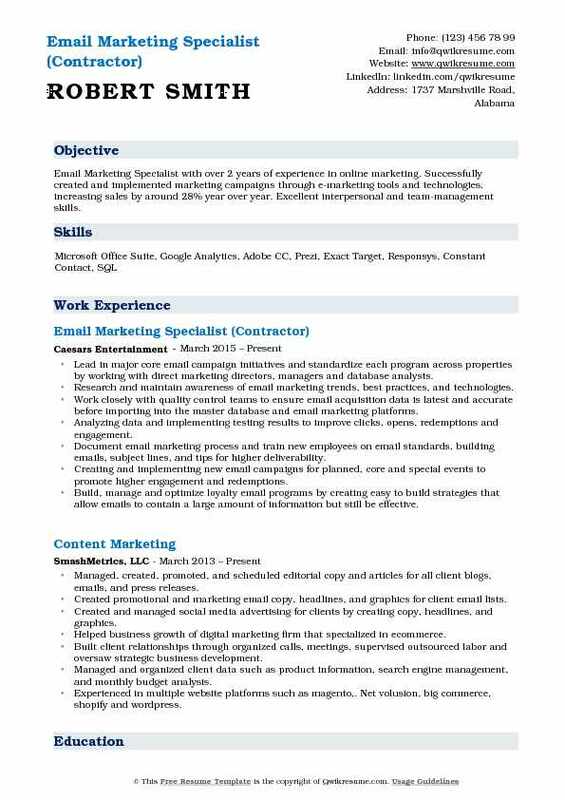 Objective : A marketing professional with experience planning and managing the execution of strategic marketing campaigns. Experience working with various companies across multiple disciplines including finance, healthcare, software, and automotive. Seeking a position that allows me to demonstrate my skills as a critical thinker, creative strategist, and tactical planner. I work to understand my clients, uncover business problems and objectives, and produce solutions to deliver successful results. Email marketing account management of approximately 30 automotive dealership accounts, with an average customer email base of 12,000 each. Proactively managed each dealership account through regular account reviews, follow-ups and reporting to evaluate the effectiveness of digital marketing campaigns. Designed custom email campaigns through Photoshop and Dreamweaver (CSS, HTML) and ensure each email is deliverable with approved spam scores. Worked with partners across company departments including social media, paid search and website management to make certain of continuity of message across digital platforms, in addition to data teams to ensure accurate and up-to-date customer data. Collaborated with product managers to improve customer-facing reports and campaign loading efficiency. Assisted in redesign and implementation of an automated lifecycle email program, resulting in an increase of average click to open rates from 3. 79% to 38. 84%. Successfully project managed numerous email campaigns simultaneously with high deliverability rates and open rates. 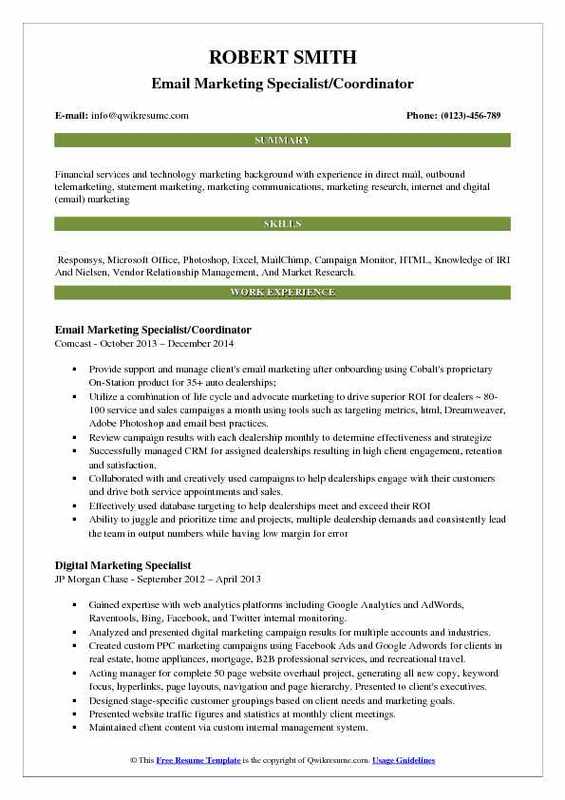 Headline : Email Marketing Specialist with over 2 years of experience in online marketing. Successfully created and implemented marketing campaigns through e-marketing tools and technologies, increasing sales by around 28% year over year. Excellent interpersonal and team-management skills. Lead in major core email campaign initiatives and standardize each program across properties by working with direct marketing directors, managers and database analysts. Research and maintain awareness of email marketing trends, best practices, and technologies. Work closely with quality control teams to ensure email acquisition data is latest and accurate before importing into the master database and email marketing platforms. Analyzing data and implementing testing results to improve clicks, opens, redemptions and engagement. Document email marketing process and train new employees on email standards, building emails, subject lines, and tips for higher deliverability. Creating and implementing new email campaigns for planned, core and special events to promote higher engagement and redemptions. Build, manage and optimize loyalty email programs by creating easy to build strategies that allow emails to contain a large amount of information but still be effective. 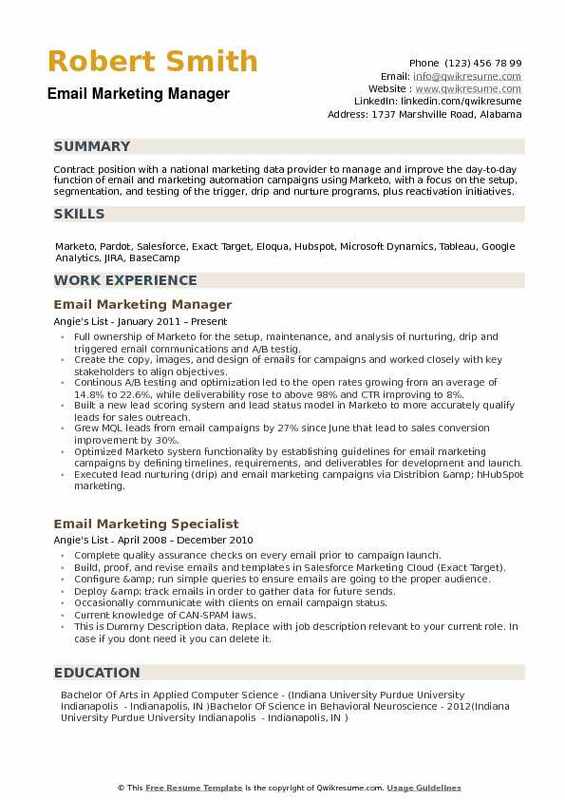 Summary : Obtain a specialist role where I can create meaningful email marketing campaigns that drive sales and increase revenues and expand my skills in marketing automation. Responsible for the implementation and launch of email campaigns for full-service clients of an enterprise level email service provider. Tasks include project management of email campaign process; setting up campaigns in the BH system, scheduling and coordination of creative and QA resources, obtaining client approval and launch of campaigns within approved timeline. 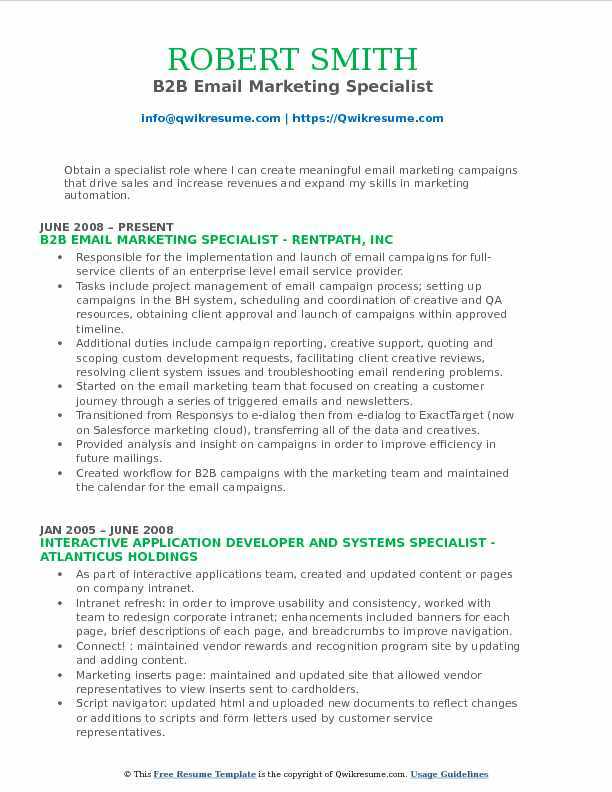 Additional duties include campaign reporting, creative support, quoting and scoping custom development requests, facilitating client creative reviews, resolving client system issues and troubleshooting email rendering problems. Started on the email marketing team that focused on creating a customer journey through a series of triggered emails and newsletters. Transitioned from Responsys to e-dialog then from e-dialog to ExactTarget (now on Salesforce marketing cloud), transferring all of the data and creatives. Provided analysis and insight on campaigns in order to improve efficiency in future mailings. Created workflow for B2B campaigns with the marketing team and maintained the calendar for the email campaigns. Objective : Analytical, strategic, and personable. 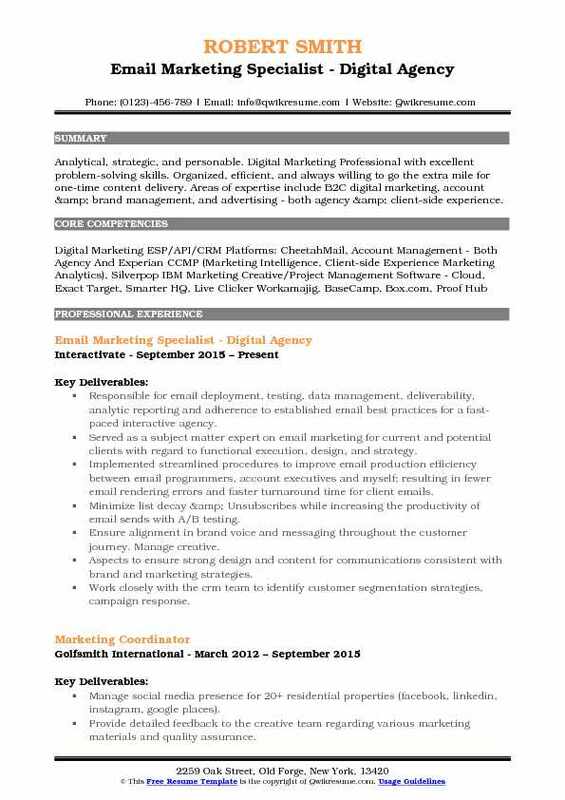 Digital Marketing Professional with excellent problem-solving skills. Organized, efficient, and always willing to go the extra mile for one-time content delivery. Areas of expertise include B2C digital marketing, account & brand management, and advertising - both agency & client-side experience. Responsible for email deployment, testing, data management, deliverability, analytic reporting and adherence to established email best practices for a fast-paced interactive agency. 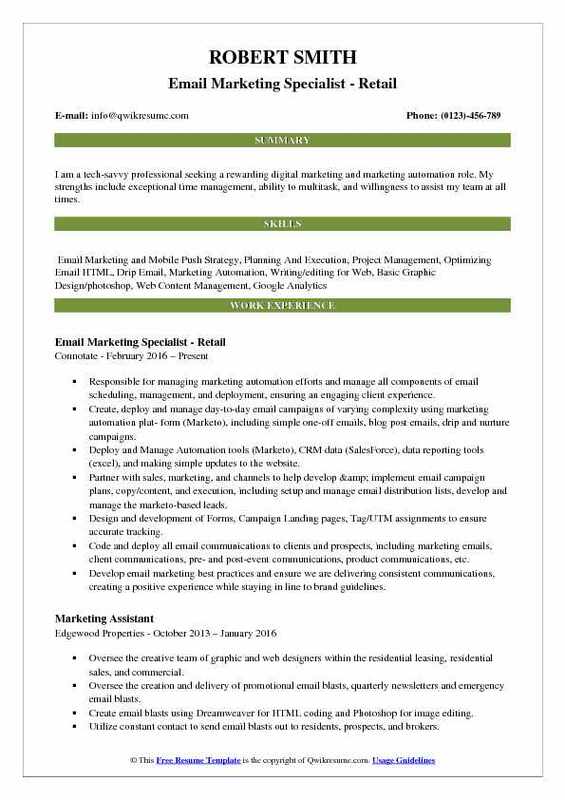 Served as a subject matter expert on email marketing for current and potential clients with regard to functional execution, design, and strategy. Implemented streamlined procedures to improve email production efficiency between email programmers, account executives and myself; resulting in fewer email rendering errors and faster turnaround time for client emails. Minimize list decay & Unsubscribes while increasing the productivity of email sends with A/B testing. Ensure alignment in brand voice and messaging throughout the customer journey. Manage creative. Aspects to ensure strong design and content for communications consistent with brand and marketing strategies. Work closely with the crm team to identify customer segmentation strategies, campaign response. Manage SMS program for both brands including content creation, strategy & execution. Objective : High-caliber, detail oriented marketing professional seeking a position that will provide a challenging opportunity to significantly contribute and increase a company's efficiency, organization, growth, and profitability. Managed deployment and design of CRM data driven email communications used to generate e-commerce based loan submissions. acquisition, Performing/Non-Performing/At Risk brokers, Tradeshow and annual promotional contests for obtaining new business. Management of the ESP vendor relationship, and maintain compliance with CAN-SPAM act. Planning and maintaining the email schedule, compiling and analyzing email metrics, designing/coding email utilizing dynamic content, segmentation and personalization for maximum relevance and deliverability. Responsible for email deployment, marketing database hygiene, reporting metrics, scheduling and list pruning. Redesigned and optimized existing email campaigns to adhere to current industry design, coding and best practices guidelines. Acted as subject matter expert for email marketing and consulted with external departments, and company subsidiaries with regard to email best practices and CAN-SPAM compliance. 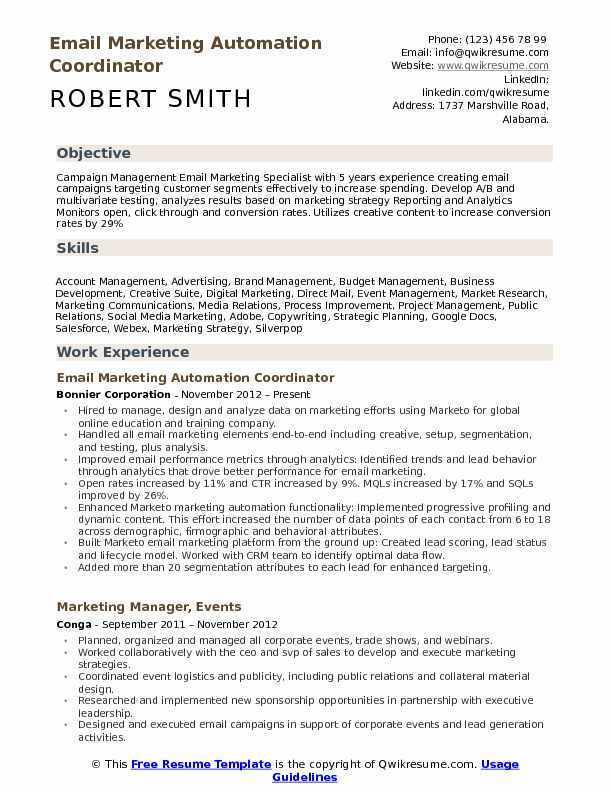 Headline : Contract position with a national marketing data provider to manage and improve the day-to-day function of email and marketing automation campaigns using Marketo, with a focus on the setup, segmentation, and testing of the trigger, drip and nurture programs, plus reactivation initiatives. Full ownership of Marketo for the setup, maintenance, and analysis of nurturing, drip and triggered email communications and A/B testig. Create the copy, images, and design of emails for campaigns and worked closely with key stakeholders to align objectives. Continous A/B testing and optimization led to the open rates growing from an average of 14.8% to 22.6%, while deliverability rose to above 98% and CTR improving to 8%. Built a new lead scoring system and lead status model in Marketo to more accurately qualify leads for sales outreach. Grew MQL leads from email campaigns by 27% since June that lead to sales conversion improvement by 30%. Optimized Marketo system functionality by establishing guidelines for email marketing campaigns by defining timelines, requirements, and deliverables for development and launch. Executed lead nurturing (drip) and email marketing campaigns via Distribion & hHubSpot marketing. Hired to manage, design and analyze data on marketing efforts using Marketo for global online education and training company. Handled all email marketing elements end-to-end including creative, setup, segmentation, and testing, plus analysis. Improved email performance metrics through analytics: Identified trends and lead behavior through analytics that drove better performance for email marketing. Open rates increased by 11% and CTR increased by 9%. MQLs increased by 17% and SQLs improved by 26%. Enhanced Marketo marketing automation functionality: Implemented progressive profiling and dynamic content. This effort increased the number of data points of each contact from 6 to 18 across demographic, firmographic and behavioral attributes. Built Marketo email marketing platform from the ground up: Created lead scoring, lead status and lifecycle model. Worked with CRM team to identify optimal data flow. Added more than 20 segmentation attributes to each lead for enhanced targeting. 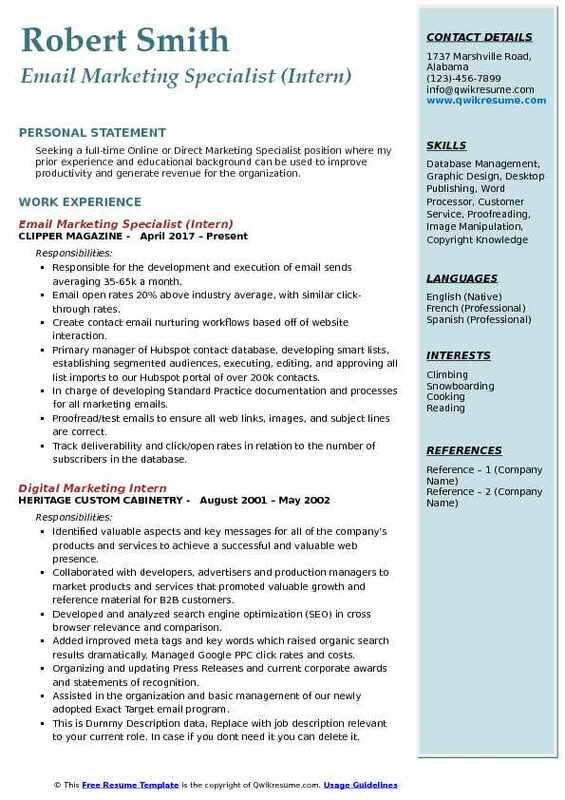 Summary : Creative self-starter with a proven record of successful marketing with Fortune 500 companies Demonstrated success with Email Marketing, Product Marketing, Marketing Communications, Market Research, Reporting, Event Management 5+ years of leadership positions in the business realm. Responsible for development of email campaign calendar and provide direction to design and copywriter resources, based on email best practices and past results. Responsible for day to day execution of email campaigns, via Bronto, to US and Canadian customers. Responsible for providing bi-weekly analysis and reports to management highlighting results of both batch and automated programs. Responsible for A/B testing for the purpose of optimizing open rates, click rates, and conversion rates. Successfully implemented an abandoned cart program, welcome series program, reactivation program, and purchase anniversary program. Launched pop up program to collect email addresses and gathered over one thousand email addresses over three months. Successfully launched an integrated campaign for replenishment products, including design and direction for email and landing page. End-to-end ownership of email marketing campaigns by coordinating activities of design, content and technical teams to meet multiple, interdependent deadlines. 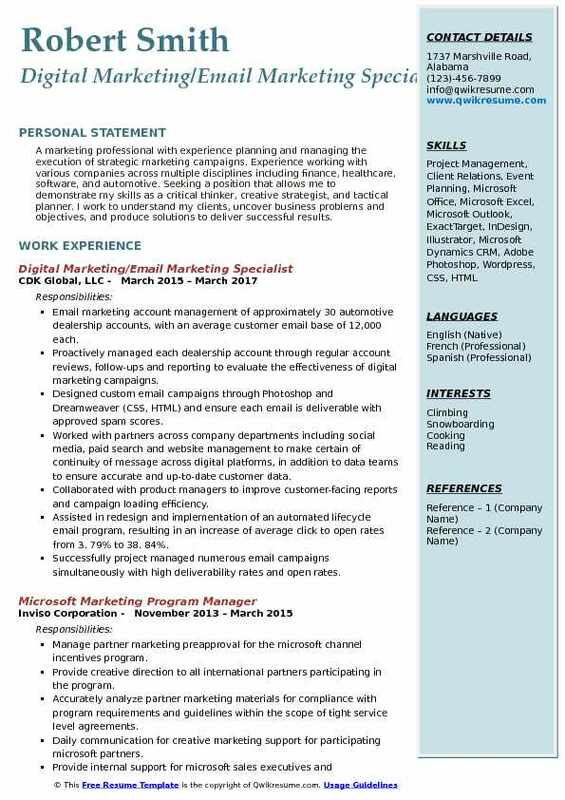 Skills : Responsys, Microsoft Office, Photoshop, Excel, MailChimp, Campaign Monitor, HTML, Knowledge of IRI And Nielsen, Vendor Relationship Management, And Market Research. Utilize a combination of life cycle and advocate marketing to drive superior ROI for dealers ~ 80-100 service and sales campaigns a month using tools such as targeting metrics, html, Dreamweaver, Adobe Photoshop and email best practices. Successfully managed CRM for assigned dealerships resulting in high client engagement, retention and satisfaction. Collaborated with and creatively used campaigns to help dealerships engage with their customers and drive both service appointments and sales. Headline : Tech-savvy Email Marketing, deployment, and analytic strategist. I bring a high-level understanding of email open rates, hard and soft bounce rates as well as whitelisting and unsubscribe tracking. I am highly capable of researching and defining performance goals and any areas in need of improvement based on statistical reporting metrics. Managed reporting of campaign results and provide results to Education, Nursing and Business teams and made strategic recommendations to the Director to improve email process and success. Implemented tests to be executed within email marketing campaigns to better understand what messages and timing best drive conversion from our email audience. Created and documented the new process for cleaning list and querying against opt-out database to ensure our adherence to CAN-SPAM. Implemented welcome series for Retention team, deadline and re-engagement campaigns. Monitored sender reputation and email deliverability, via ReturnPath Sender Score and Silverpop metrics. 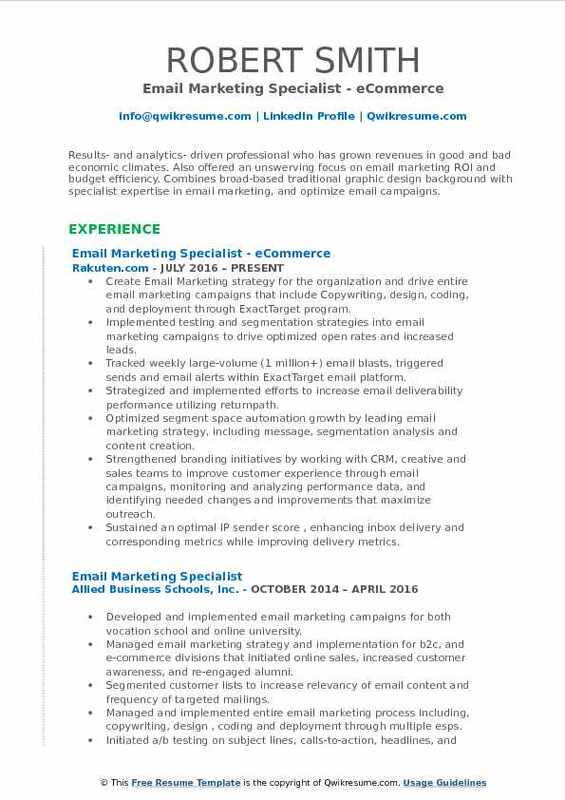 Objective : Seeking a full-time Online or Direct Marketing Specialist position where my prior experience and educational background can be used to improve productivity and generate revenue for the organization. Responsible for the development and execution of email sends averaging 35-65k a month. Email open rates 20% above industry average, with similar click-through rates. Create contact email nurturing workflows based off of website interaction. Primary manager of Hubspot contact database, developing smart lists, establishing segmented audiences, executing, editing, and approving all list imports to our Hubspot portal of over 200k contacts. In charge of developing Standard Practice documentation and processes for all marketing emails. Proofread/test emails to ensure all web links, images, and subject lines are correct. Track deliverability and click/open rates in relation to the number of subscribers in the database.